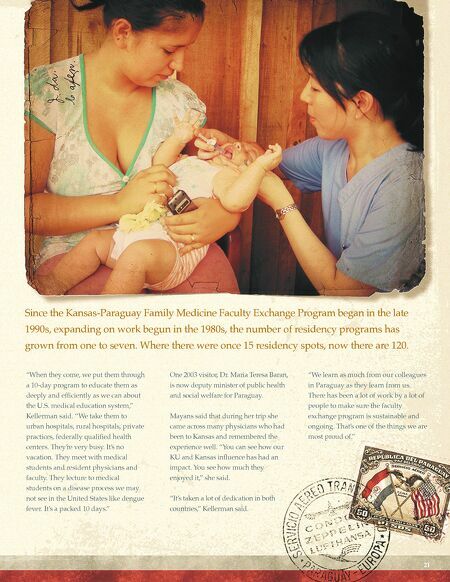 21 Since the Kansas-Paraguay Family Medicine Faculty Exchange Program began in the late 1990s, expanding on work begun in the 1980s, the number of residency programs has grown from one to seven. Where there were once 15 residency spots, now there are 120. "We learn as much from our colleagues in Paraguay as they learn from us. 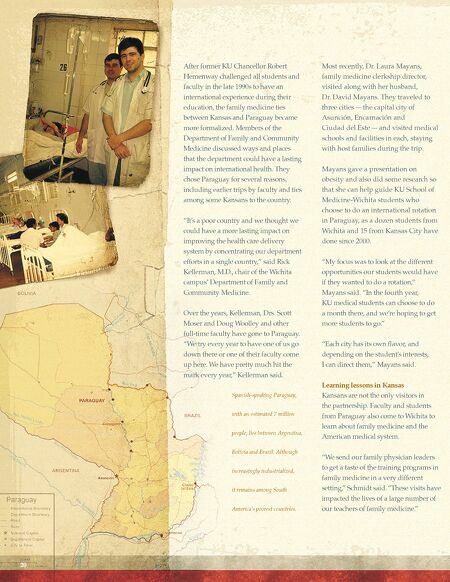 There has been a lot of work by a lot of people to make sure the faculty exchange program is sustainable and ongoing. That's one of the things we are most proud of." One 2003 visitor, Dr. Maria Teresa Baran, is now deputy minister of public health and social welfare for Paraguay. Mayans said that during her trip she came across many physicians who had been to Kansas and remembered the experience well. "You can see how our KU and Kansas influence has had an impact. You see how much they enjoyed it," she said. "It's taken a lot of dedication in both countries," Kellerman said. "When they come, we put them through a 10-day program to educate them as deeply and efficiently as we can about the U.S. medical education system," Kellerman said. "We take them to urban hospitals, rural hospitals, private practices, federally qualified health centers. They're very busy. It's no vacation. They meet with medical students and resident physicians and faculty. They lecture to medical students on a disease process we may not see in the United States like dengue fever. It's a packed 10 days."